1987, Starring David Adamson, Lee Ann Nestegard, Ed Chester, Peter Roberts. Directed by Robert Bouvier (Transcontinental Pictures Industries). 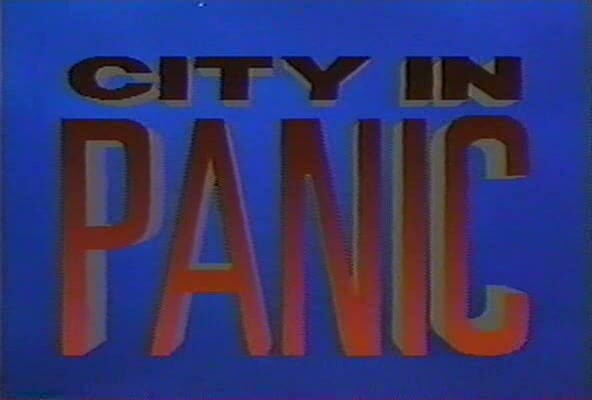 One of the more eccentric contributions to Canada's classic 1980s horror canon, City in Panic is a film that sometimes seems spectacularly insensitive and unaware of itself. Reducing the AIDS epidemic to a convenient plot device, penny-pinching producer Peter Wilson and director Robert Bouvier serve up a decidedly gay-themed whodunit slasher that trades on a few brutal thrills to compensate for a grimy, amateurish approach. Though obviously made by cinema-savvy filmmakers who saw fit to work in specific references to the work of Alfred Hitchcock and Fritz Lang, it's a film that squanders an interesting idea and almost seems embarrassed of its lowbrow aspirations. Wilson is no doubt the catalyst behind this straight-to-VHS film. One of the undisputed kings of no-budget tax shelter fare despite a rather short resumé, Wilson actually started his career on a mostly respectable note, handling George Mendeluk's mainstream debut feature Stone Cold Dead (1979) and working with the director again as one of the co-writers of his 1985 Canadian prison farce Doin' Time. By the late 1980s, however, Wilson was among the few remaining would-be-moguls trying to squeeze the final few drops out of the doomed tax shelters, cranking out low budget genre fare under his Video Impact Productions banner. Before making the infamous Science Crazed--perhaps his most curious, cash-strapped crown jewel--Wilson attempted to tap into the decade's horror boom by infusing slash-and-stalk scenes with a sleazy, ripped-from-the-headlines immediacy. Originally titled The AIDS Murders (yes, really), City in Panic is the story of a mostly undisguised downtown Toronto terrorized by a serial killer nicknamed "M" after the letter left carved in the back of each victim. The story centres around talk radio host Dave Miller (David Adamson), a rumpled but strongly opinionated journalist frequently on the attack against rival right-wing newspaper scribe Alex Ramsey (Peter Roberts), who he feels is inappropriately sensationalizing the city's latest murder spree. But while Dave interviews psychological experts on the air about psychotic personalities in hopes of understanding the killer, M is busy out on the streets, racking up an impressive body count. 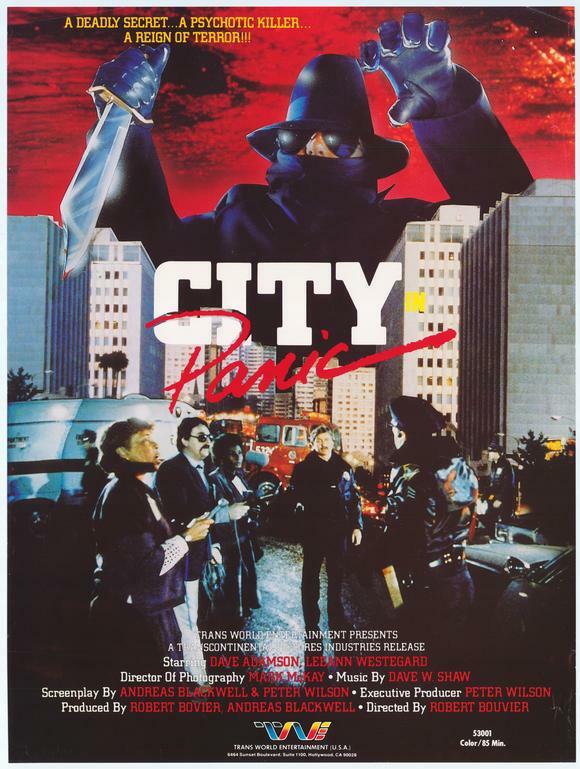 Looking like a classic giallo killer in dark glasses, a dark fedora and trenchcoat and the requisite leather gloves, M slices up a bathhouse patron, runs down a male stripper and castrates an unlucky security guard who picked the wrong glory hole. Working with the co-operation of a desperate police captain (Ed Chester), Dave eventually goads M to call in to his show, but the police trace on the call fails to turn up a suspect. Only after Dave discovers that the victims match a list of AIDS-clinic patients does he uncover the killer's (unsurprising) real identity and actual motive. Although this typically sparse and roughly crafted film is much more coherent than Science Crazed, City in Panic's stunningly flippant approach to AIDS victims and the way it kills almost exclusively gay men has made the film notorious in some circles. The film certainly deserves some of that reputation--Wilson, who co-wrote the script, obviously tried to do something different by hitching his killer's gimmick to a timely topic, but the film generally treats the disease as little more than a convenient plot device. Aside from an offhanded reference to watching a TV special on AIDS, there's simply no room for sympathy or any discussion of how viewers might protect themselves against this disease that, according to the film's plot, affects almost exclusively gay men. And to complicate matters further, it's not the AIDS epidemic that's portrayed as deadly, just the killer who has it in for anyone who is afflicted. The film's portrayal of gay men, however, is more nuanced, if just a little. Beginning with a pre-credits sequence of a male patron of Toronto's historic Oak Leaf Steam Bath being stabbed to death in the shower in a crude approximation of Psycho's most famous scene, City in Panic announces its intention to subvert horror's traditional gender roles early. Featuring almost exclusively male victims being fetishistically slashed with a straight-razor and even positioning Dave as the male "final girl" in the climax, the film's aggressive gender reversals seem to have been made with a gay audience in mind. Though it can certainly be argued that several of the victims are stuck playing out stereotypically promiscuous gay activities (especially right before dying), their characterization is surprisingly normalized. Aside from the embarrassingly effeminate portrayal of Ramsay, most of the other victims are just background characters whose true sexuality isn't even mentioned until it becomes an obvious part of the killer's pattern. In one scene, Dave appears surprised to learn that his recently murdered local bartender was both gay and had AIDS. It's also worth noting that the film's sole homophobe--an epithet-spitting cop--is portrayed as a complete buffoon. 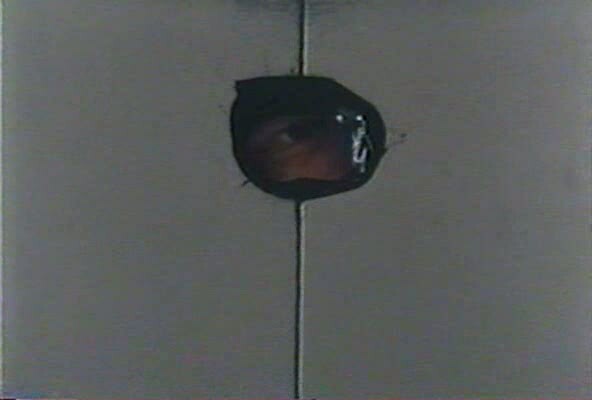 Bouvier's direction is sometimes effective, such as the atmospheric chase through a mannequin factory that concludes the film, but more often it's just annoying. 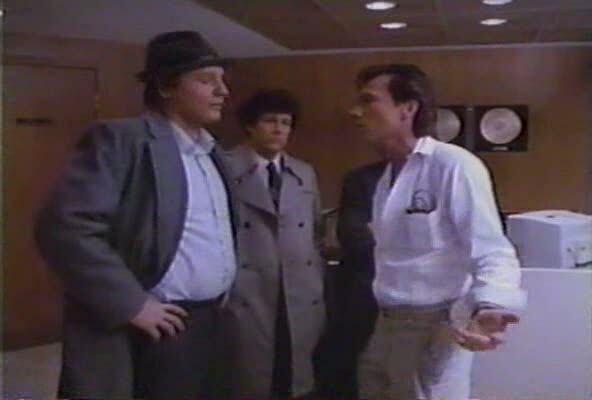 One particularly clumsy scene is inexplicably shot from Dave's point of view, as he frantically paces in front of the secretary's desk at the radio station. It's enough to make most viewers seasick, though POV is somewhat more effectively used later in one of the kills as the victim, upside down and locked into some kind of exercise equipment, only gets fleeting glances of the killer approaching as he sways back and forth on a bar. But despite the brief flashes of competence, it's the ponderous pace that really does in City in Panic--while biding time between kills, the story gets stuck in patience-testing radio talk show scenes--callers blabbing on about making the streets safe, David making laboured accusations about media fearmongering and psychologists offering tired insights about the murderer's mindset. Wilson and Bouvier next tackled something less sleazy but now even more obscure, the action adventure romp Avenging Warriors (AKA The Shaman's Source) before Science Crazed took Wilson's career to new levels of impoverished filmmaking. Wilson never got a film off the ground again, despite making frequent press announcements of tantalizing potential projects like Co-ed Massacre, Fire Engine Blue, Thor: God of Thunder, Hunchback of New York and Murder in High Heels. Though Video Impact Productions never made the deep impression on Canadian film implied by its name, Wilson's notorious productions and off-kilter film sensibility still live on in City in Panic and Science Crazed--only perhaps in a way never originally intended.